“Another revelation for me from my very early teens was the Marx Brothers, their black-and-white films regularly being shown on TV on Sunday afternoons. My God, they were from 1935 and they were so funny! 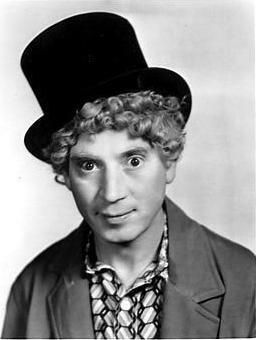 But more than that, Harpo’s performances could jump from perfect insanity to perfect solemnity. In A Day at the Races, he plays the piano with such gusto that it self-destructs section by section, then completely. Only then does he take the iron piano-wire frame, arrange it upright and play it like a harp, and in a way I can only describe as holy. In Go West, he plays the harp on an American Indian fabric loom, his performance hypnotically beautiful. When he finishes, the Indian chief standing behind him places his hand on Harpo’s shoulder in a moment of sacred silence. Even at the time, I could sense that Harpo had just been playing in honour of a people dispossessed. Whether verbal or on the piano, I didn’t so much take to Chico’s performances, which were more restrained, until I realised the golden secrets of comedy that they were demonstrating: economy and timing. For me the main man was Groucho. For me, these moments seemed to hover over reality and made me feel like I was too. They were introducing me to something I would much later learn to be called ‘surrealism’. Lines such as these were, to me, like the sun coming up. 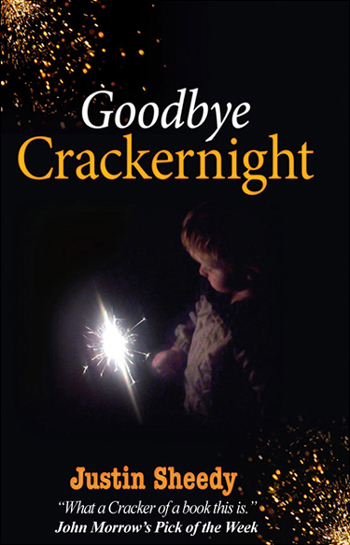 Goodbye Crackernight by Justin Sheedy, from which this excerpt is taken, now available at Amazon. CLICK HERE.